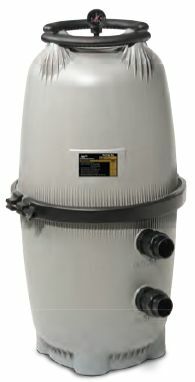 Jandy 460 square foot cartridge filter CL460 by Zodiac Pool Systems. Jandy® CL Series cartridge filters are simple to use and maintain. They are manufactured from tough UV and corrosion-resistant, thermoplastic. Our cartridge filters provide extra large capacity so there is a much longer period of time between cleanings. Handy tank lid handles make installation and cleaning easy. Our proprietary combination pressure gauge/air release valve with built in Clean/Dirty indicator accurately tells you when the filter requires cleaning. We offer a choice of 340, 460, and 580 square foot capacity models. Filter comes complete with: bulkhead unions, cartridges and combination pressure gauge/air release valve with Clean/Dirty indicator. Jandy® is a recognized leader in the swimming pool industry since the early 1950's. They also manufacture heaters and heat pumps. Click Here for a CL Filter Manual. Combination pressure gauge/air release valve with Clean/Dirty indicator. Extra large capacity for extended cleaning cycles. Heavy duty, rigid tank clamp. 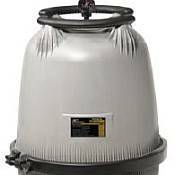 Tough UV and corrosion-resistant, thermoplastic tank.